Topological insulators are recently discovered compounds that possess peculiar electronic properties : they are insulating in the bulk but conducting at the surface . 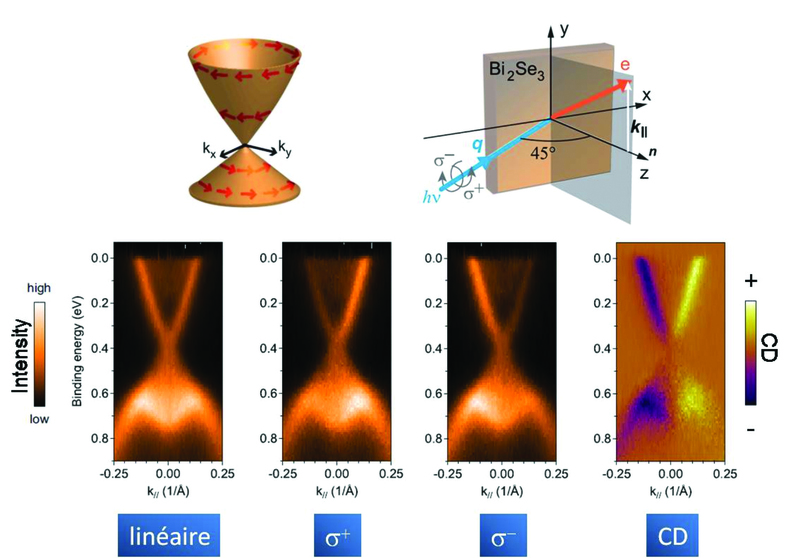 The surface state responsible for the conduction is characterized by a linear dispersion at the center of the Brillouin zone (Dirac cone) and by a helicity : spin and momentum are perpendicular in the surface plane. Circular dichroism in angle resolved photoemission has been proposed recently as a technique allowing one to probe such a spin texture directly  . 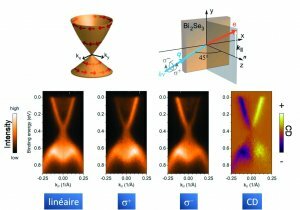 Researchers of the group « Growth and properties of hybrid thin film systems » at INSP have used this method to study epitaxial thin films of Bi2Se3. Bi2Se3 is, along with the parent compound Bi2Te3, one of the most studied topological insulators. Growth by molecular beam epitaxy of this lamellar compound on GaAs(111) allows to obtain samples with a very high structural quality and with a precisely controlled thickness. It is then possible to study the evolution of the electronic structure as a function of the thickness. Circular dichroism in angle resolved photoemission measurements were performed at Elettra synchrotron, on the APE beamline. The principle of the measurement is described schematically in Figure 1 : the dispersion of the Dirac cone is probed using left-handed and right-handed circularly polarized light, the dichroic signal is the difference between the two signals. Schematic of the Dirac cone of the topological surface state of Bi2Se3, the red arrows symbolize the spin texture. Experimental geometry used for studies of the dichroism in angle resolved photoemission. Dispersion of the Dirac cone measured in linear polarization, circular polarization and circular dichroism for a 50 nm thick film of Bi2Se3. Figure adapted from Physical Review B 88, 241410(R) (2013). The sign inversion of dichroism on the branches above and below the Dirac point at the zone center has been interpreted as a signature of the peculiar spin texture of the topological surface state in the first studies performed with fixed photon energy. The measurements performed on the APE beamline question such a simple connection. Indeed, when varying the energy of the photons, one observes clear inversions of dichroism that can even vanish, as shown in Figure 2. However, the spin texture is still there. Evolution of circular dichroism as a funcrion of the incident photon energy. These results show that a model of the photoemission process including a proper description of initial and final states [4,5] is mandatory in order to link the dichroic signal to the spin texture of the topological state and to explain the photon energy dependence of the signal. What happens when the spin texture is altered ? Does the dichroism vanish ? There again, the situation is not simple. The precise control of the molecular beam epitaxy growth allows studying ultrathin films with a well defined thickness, here 3 nm. At such a small thickness, the topological state is strongly perturbed by the coupling between the two interfaces of the film through tunneling. Theoretically, this should severely affect the spin texture. However, experimental results show that a strong dichroic signal is still present, as shown in Figure 3. Schematic of the spin texture for an ultrathin film with gap opening. 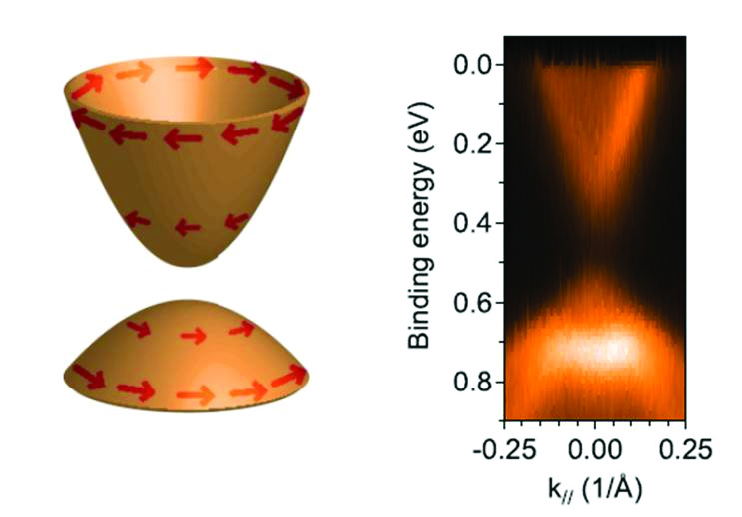 Dispersion measured with circularly polarized light : the photoemission intensity is larger for positive values of k for binding energy between 0 and 0.4 eV. 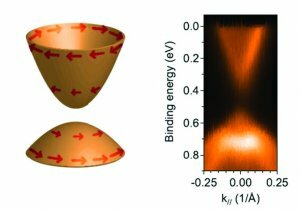 Taken altogether, these results show that using the dichroic signal in order to probe the spin texture of topological insulator is a complex issue and that it is important to study the photon energy dependence of the signal. This work benefited from financial support of ANR (ANR-2011-BS04-0019). Y. H. Wang, D. Hsieh, D. Pilon, L. Fu, D. R. Gardner, Y. S. Lee, and N. Gedik, Phys. Rev. Lett. 107, 207602 (2011). S. R. Park, J. Han, C. Kim, Y. Y. Koh, C. Kim, H. Lee, H. J. Choi, J. H. Han, K.D. Lee, N. J. Hur, M. Arita, K. Shimada, H. Namatame, and M. Taniguchi, Phys. Rev. Lett. 108, 046805 (2012). Z.-H. Zhu, C. N. Veenstra, S. Zhdanovich, M. P. Schneider, T. Okuda, K. Miyamoto, S.-Y. Zhu, H. Namatame, M. Taniguchi, M.W. Haverkort, I. S. Elfimov, and A. Damascelli, Phys. Rev. Lett. 112, 076802 (2014).